Parkland Courier & Logistics Parkland Courier and Logistics is the reliable and economical solution for your total freight movement – be it personal industrial, or commercial, we are your turnkey solution. 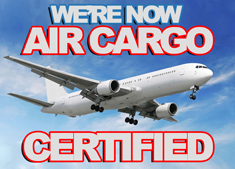 Throughout Parkland’s 30+ year history, we have become Air Cargo Certified to compliment our other strong skills in the messenger van, body job, flat deck and tractor markets. If it’s FTL, refrigerated or temperature controlled trucking or total warehousing services, we are your North American-wide one stop freight solution. With a secured and monitored brand new company owned facility boasting multiple docks and plenty of space for pick and pack or storage space, we are ready to be your local gateway for international shipments.